Bio-X foggers are used predominately for the application of disinfection at hospitals, laboratories, pharmaceutical industries, clean rooms, healthcare, biotech & tissue culture labs, dairies, food processing areas & hatcheries etc. It is also used for the application of biocides, fungicides, pesticides. 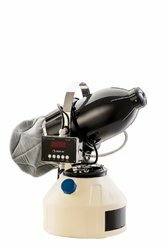 Bio-X foggers generate a fog or mist formed by Ultra low Volume (ULV) uniform sub-micron size liquid particles (Dry Fog). Liquid formulations can be applied in concentrations of 2-90% & at ¿¿¿ow rates of 1-3 liters per hour (adjustable) using upgrade Flow Control Mechanism. A Digital Timer to set the fogger on for 1-99 minutes makes the entire fogging operation hassle free. 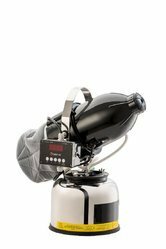 Bio-X foggers run on a high speed FHP motor that provides maximum thrust of spray; coupled with the advance thrust design of Air Jet Nozzle, the foggers achieves fog thrust of > 50 feet. Entire body & internal parts are made of materials that resist corrosion & chemical attack. The storage tank ranges from 6.5Ltrs to 8Lts to cover an area of >20,000 cubic feet. •Dry fog , uniform sub-micron size liquid particles. • Adjustable flow rates of 1-3 liters per hour. • Digital timer to set the fogger on for 1-99 minutes. • High speed FHP motor for maximum thrust for spray. • Advance thrust design of Air-Jet nozzle. • Fog thrust of >50 feet. • Highly portable can be carried or moved easily. • Cover an area of >20,000 cubic feet. Timer Devices:- Digital Timer (1-99)min. Particle Size:- Uniform Sub Microns. Liquid Flow Rate:- 1-3 ltrs/hr. (Adjustable). Flow Control Mechanism:- Available SS316. Nozel System : SS316 grade Air Nozel. Noise Level:- <88 db @ 1 meter. Air Filter:- Triple Stage With Clamp. Area Coverage:- >20,000 Cubic Fts. Power Supply:- 230 VAC, 50/60 Hz.